Wallchart for Windows | Resource scheduling system. Wallchart Windows is a powerful resource scheduling software for Windows that offers a web front end called Wallchart Web Scheduler which supports Internet Explorer. Wallchart® for Windows is a mature, robust resource scheduling solution for Windows environments which deservedly attracts incredible loyalty from its users. Although our latest browser technology solutions offer advanced features such as support for phones & tablets, mapping, MySchedule, Time Zones, Outlook 365 integration etc. they build upon the heritage of Wallchart® for Windows. We still support Wallchart® for Windows because customers that use it, love it. Our latest Version 11 system supports Windows 10 and a range of enhancements that are available to existing customers. Until recently, our Windows based scheduling view was king of the hill. It was always more feature rich and faster than a browser system. But now, all that has changed. It’s hard to believe, but our new 100% browser system is more feature rich and faster than Wallchart® for Windows. 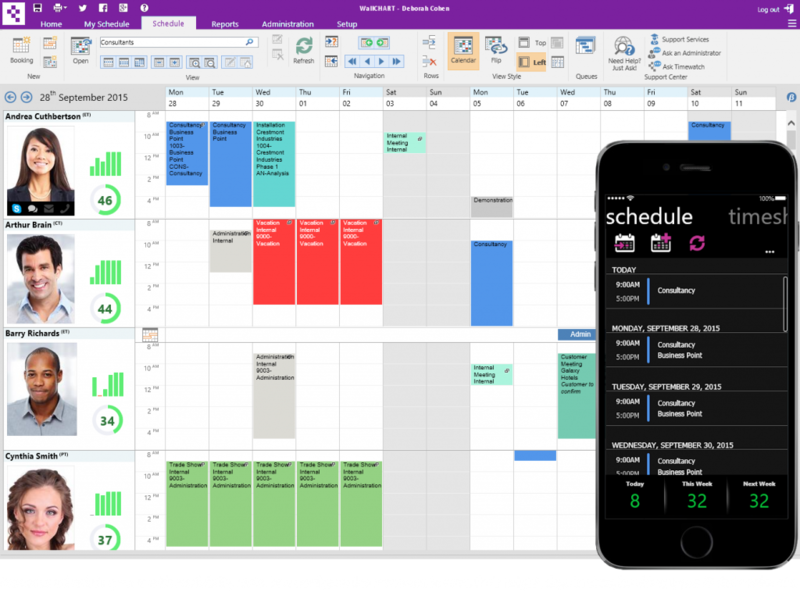 Much, much faster, and unlike our older Wallchart® Web Scheduler, it supports all browsers on PCs and Macs, can even run on Phones and Tablets, and can be integrated with Outlook 365, Exchange 2013 & 2016 and Google Calendars. To assist Wallchart® for Windows customers wishing to gain access to these facilities, we’ve created a seamless upgrade path to Wallchart® Browser Edition which is available for installation on your servers, or hosted on ours. You can even take your data with you and receive a 100% trade in on your current system. 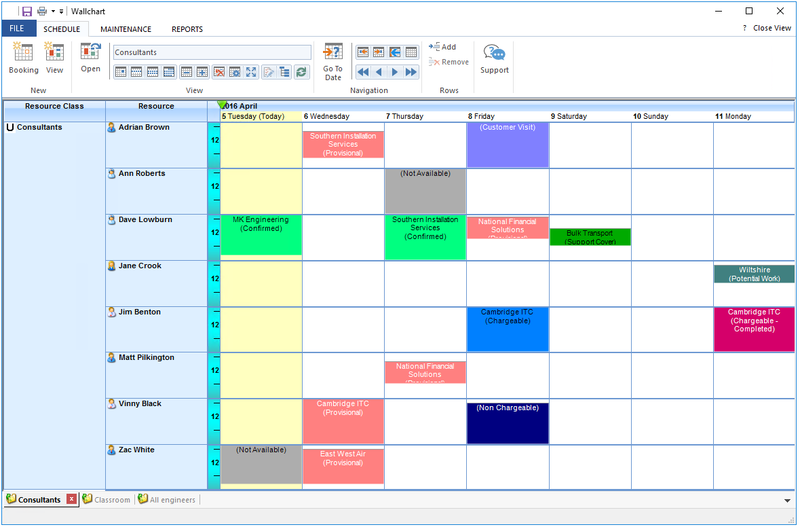 Wallchart® for Windows Exchange Integrator seamlessly syncs Wallchart® for Windows bookings with Outlook. The system supports Exchange 2007 & 2010. Customers looking to sync with Office 365 or Exchange 2013 / 2016 should upgrade our new Wallchart® Cloud system as this can integrate with the new cloud oriented design of Exchange 2016 and Office 365. Internet Explorer front end for Wallchart® for Windows. The Wallchart® for Windows Web Scheduler provides a browser based front end for Wallchart® for Windows. This allow users to view schedules via Internet Explorer. If your organization is a heavy user of the Web Scheduler, we recommend you take a look at our new cloud edition of Wallchart®. This provides an upgrade path from Wallchart&reg’ for Windows, supports Chrome, Firefox, Safari etc. on all devices, is blistering fast (even faster than Wallchart® for Windows) and we can even migrate your existing Wallchart® for Windows database.